The beginning of the Eighties was a truning point in the cameras history since that corresponds to the appearance of the autofocus on the reflex cameras (Pentax ME-F) or on the compact ones. 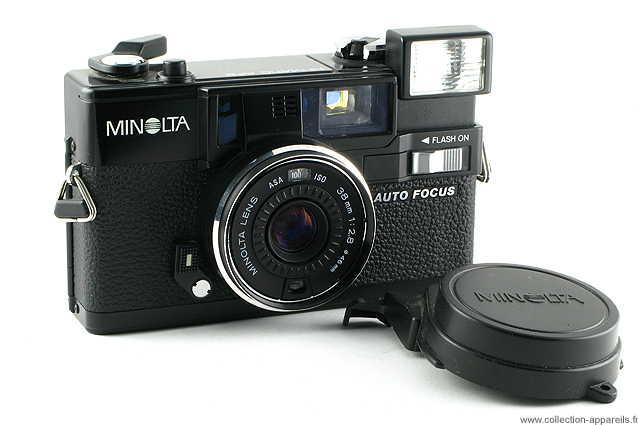 If now the autofocus is on the compact ones with accessible tariff, there is nearly twenty years, this one was on compact rather top-of-the-range, extremely well manufactured ones. The plastic had already sent to the oubliettes aluminum and other metals, but its use had not modified the design of the cameras yet. The rather angular forms remain close to those of the end of the Sixties and of the 70 ' S. Biodesign does not exist yet, one is far from Olympus mju. There is no yet DX coding . The advance of film and rewinding are manual. The flash exit is also manual. The cell window is at bottom of the lens.